Receding gums tend to sneak up on you. Few dental patients simply wake up one morning and notice a frighteningly long length of tooth extruding from their mouths. Instead, year after year of changing bodies and sometimes poor habits take their toll. Gaps start to form where healthy tissue once was, and cumulative health impacts slowly start to add up. But what exactly is gum recession? How many people deal with it? And what steps can you take to treat and prevent its insidious onset? Gum Recession: Is this a common problem? Gum recession occurs when the gums in your mouth gradually begin to pull away from the teeth. How common is it exactly? Well, the statistics surrounding periodontal disease provide us with a clue. 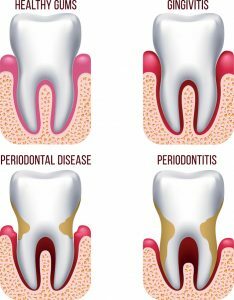 Periodontal disease is the primary cause of gum recession, and Centers for Disease Control and Prevention have reported that nearly half of adults age 30 and up have some form of it. The numbers get even worse as we age. The same study indicated that three out of four adults in their mid-sixties and older suffered from it. Many factors can lead to gum disease. Some include poor oral hygiene, brushing too hard, hormonal changes during menopause, and simple aging. Additionally, clenching your teeth and using tobacco may cause gum recession. Why should I be concerned about a receding gum line? Some might wonder if they ought to worry about gum recession given its ubiquity. The answer is a resounding, “Yes!” When gum recession occurs, deep gaps appear within your mouth. These gaps start to collect bacteria, and you can’t easily clean these new spaces by brushing or flossing. If left untreated, these gaps can eventually leave the root of a tooth (or many teeth) exposed, leading to discomfort, outright pain, and bone destruction. That last symptom will eventually lead to tooth loss. Gum recession typically doesn’t hurt, which is part blessing and part curse. Obviously no one wants to experience oral pain. However, discomfort is a hard-to-miss symptom, and the only thing most people notice when they have gum recession is a tooth that looks a little longer than the rest or a notch they can probe with their tongue. Severe cases of gum loss often involve gum grafts, a surgical process that requires some form of sedation. Other helpful procedures involve regenerating bone with a specialized protein and root planing the gap areas. Like most diseases, it’s easier to prevent gum recession than to treat it. Quitting tobacco, eating a balanced diet, and brushing and flossing always help. If you tend to grit your teeth, consider purchasing a mouth guard. Finally, think about fixing any long-standing dental issues you’ve avoided. Believe it or not, a misaligned bite can also cause gum recession. If you’re concerned about gum recession or are looking for treatment, contact Chicago’s dental experts Westend Dental. We can help get your smile back in tip-top shape. Schedule an appointment today with Lincoln Park’s Westend Dental.